Women Of LA's Skid Row Tell Their Stories Through The Anger, Despair On Their Faces One 51-year-old woman has been living on the streets for two years. "I've been raped, I've been stabbed, it's been hard out here for me," she says. To capture the specific horror of Los Angeles' homeless crisis, one just needs to enter the 50-block perimeter of downtown known as Skid Row. 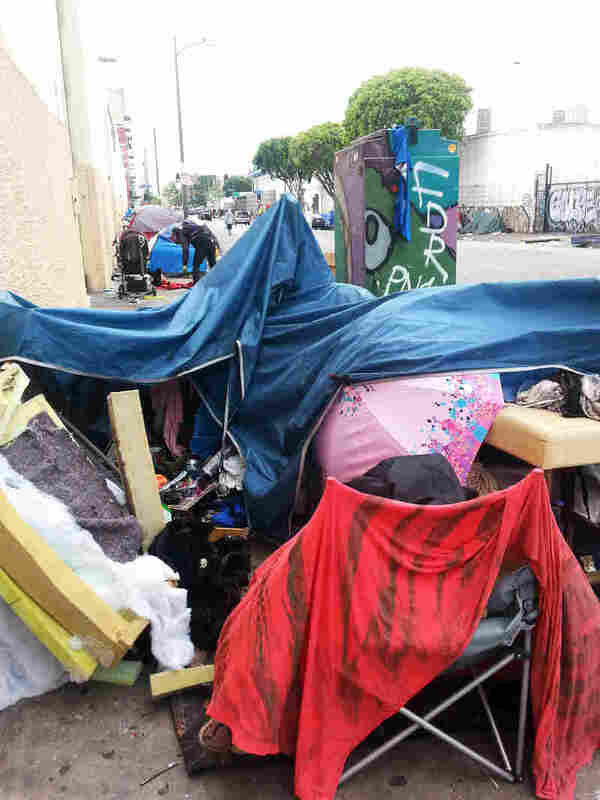 The sidewalks have disappeared, buried beneath endless rows of sagging tents and what spills from them: stuffed animals, clothing, a bicycle tire, blankets, condoms and hypodermic needles. The residents of Skid Row walk in the street, especially the women, some seemingly unaware of the misery all around them, others dodging cars that speed up just to get through this place. 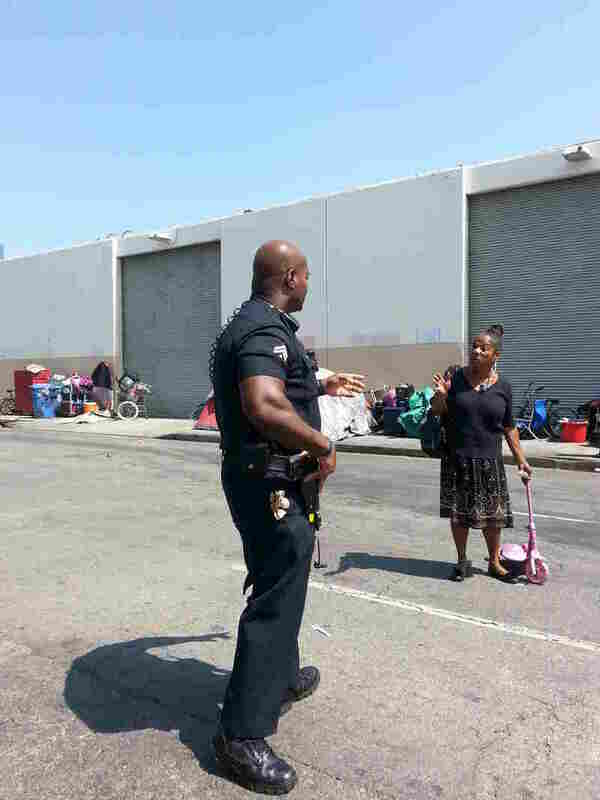 LAPD Officer Deon Joseph has been working on these streets for 20 years. He points to a tall woman with blonde-gray hair moving at a quick pace. "She's headed toward a daytime shelter where it will be much safer for her. Much safer." Joseph says there's no difference between day and night anymore. Most of the crime happens out of sight, in the tents, which have been taken over by the gangs. "Whenever I see a new face, especially a woman, I tell them the rules: don't borrow money from anybody because once you do that you are bought and paid for," he says. Just like the new condos five blocks away, the sidewalks have become expensive real estate. Joseph says the landlords are the gangs. In order to stay on the block, he explains, one woman here was forced by the Grape Street Crips to give up her entire Social Security check every month. A few feet away a woman in a bright pink t-shirt is trying to clean up the litter in front of her tent. Debra Williams says she's trying to keep it like a house. The 57-year-old has been here five months, but "five months too long," she says, "I'm trying to get outta here. I know it's too old to be down here, but things happen." "They are you or me divided by circumstance," says Georgia Berkovich, of the Midnight Mission. "A catastrophic illness in the family that depletes their savings. A victim of domestic violence who would rather live on the street than be with their abuser." Financial issues and the lack of affordable housing are increasingly impacting women. No one never imagines they'll end up on these streets, Berkovich says. "First you would stay with friends and then you'd stay with family and maybe you'd wear out your welcome and you say 'we'll just stay in our car.' "
The next step, Berkovich says, is usually a shelter. But most of the shelters are full. So, you get a tent. "But now the drug dealers and pimps have taken over your tent," she continues. "Now you're doing things you swore you would never do." Many of the women on the street pull suitcases behind them. Joyce Robles is one of them. She's wears a heavy camouflage jacket on this very hot day. Robles, 51, says her husband passed away about three years ago. She has been living on the streets for two. "I've been raped, I've been stabbed," she says, "it's been hard out here for me." You can guess how long people have been here by the anger or despair on their faces, their clothing, the way they walk. But two young women who came out of the Downtown Women's Center had none of the telltale signs of homelessness. Cat Greer, a 26-year-old with reddish-blonde hair and a flowery cotton blouse was eager to speak to someone. "We just got here from Louisville like three months ago," she says. Greer and her partner, who is deaf, thought life would be easier for them in Los Angeles. They were dropped off at the Greyhound station just blocks away. They had never heard of Skid Row. After a couple days on the street they were grateful a shelter took them in. "We can't find a place to live, there's no way to find a place to live together," she says. They say the shelter is only temporary. One hopes that is true, because here, they say, with each passing day, leaving is less of an option.